Had any positive customer service experiences lately? Does anyone take responsibility for their own actions any more? Our non-scientific evidence indicates that good, responsive customer service is very high on the list of priorities for most people. What kind of customer service are you providing to your customers? No matter what type of business you’re in, you have customers. Whether you’re a small business or a department within a large company, customer service counts. Have you asked your customers what they think of your service lately? Remember that negative comments spread much faster than positive comments. Good customer service requires some basic action on your part. This can be your business name, your name, or both. If you are in a position where the person on the other end of the phone will carry on a discussion with you, make sure you include your name. Don’t make them ask. We all learned this when we were young. How many times did your Mom or Dad ask you, “…and what do you say?” Carry what you learned in your younger years into your work. 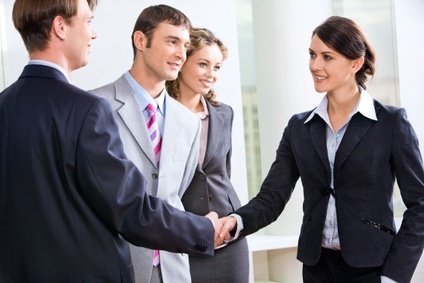 When talking to customers face-to-face, smile when appropriate. It makes you and your business more personal. If most of your business is conducted on the telephone, smiles can help here too. Your voice will sound different when you are smiling. (If you need help with this, position a small mirror by your phone and practice, practice, practice!) Think about your own reactions when someone smiles at you. Convey these positive feelings to your customers. Don’t pass the buck. Whether you’re the owner or an employee of a business, you represent that business with your presence. So maybe it’s not your “specific” job to handle the customer’s request or complaint. If you can’t personally handle it, make sure that you hand the customer off gracefully. Make sure the other person is there before you let the customer go or if necessary ensure that a message has been handled. Commitments guarantee that something will get done. It’s also a way to manage the customer’s expectations. A commitment is not, “We’ll get back to you in a couple of days.” A commitment is, “We’ll get back to you by 5:00 pm tomorrow.” This assures the customer that some action will be taken within a specific time frame. Don’t make a commitment just to get rid of a customer. Make a commitment you can keep. A kept commitment builds trust. A missed commitment destroys trust. And once trust is broken, it takes much longer to rebuild. You might be saying, “Well, these tips are just common sense. My employees and I practice these every single day.” Do you really? Have you asked your customers lately? A real simple gauge of your customer service is a follow up phone call with a few focused questions. Or, if you want to be more formal, a written survey mailed to the customer (with a self-addressed, stamped return envelope) also works great. It takes these simple steps to provide basic customer service. Don’t allow your customers to say, “What ever happened to customer service?,” about your company!